The experience of movement, of moving through buildings, cities, landscapes and in everyday life, is the only involvement most individuals have with the built environment on a daily basis. User experience is so often neglected in architectural study and practice. Architecture and Movement tackles this complex subject for the first time, providing the wide range of perspectives needed to tackle this multi-disciplinary topic. documents the architect’s, planner’s, or designer’s approach, looking at how they have sought to deploy buildings as a promenade and how they have thought or written about it. concentrates on the individual’s experience, and particularly on the primacy of walking, which engages other senses besides the visual. engages with society and social rituals, and how mutually we define the spaces through which we move, both by laying out routes and boundaries and by celebrating thresholds. analyses how we deal with promenades which are not experienced directly but via other mediums such as computer models, drawings, film and television. The wide selection of contributors include academics and practitioners and discuss cases from across the US, UK, Europe and Asia. 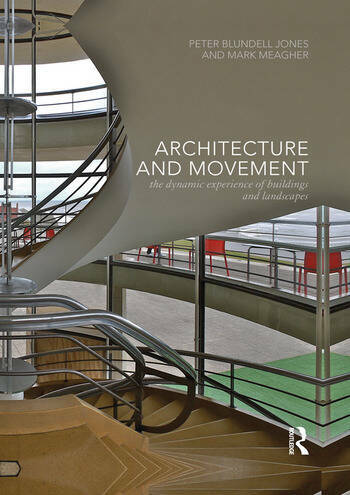 By mingling such disparate voices in a carefully curated selection of chapters, the book enlarges the understanding of architects, architectural students, designers and planners, alerting them to the many and complex issues involved in the experience of movement. Peter Blundell Jones is a British architect, historian, academic and critic. Educated at the Architectural Association School, London, he taught at the University of Cambridge and London South Bank University before becoming Professor of Architecture at the University of Sheffield. He is a prolific author on architectural history and theory and he has written monographs on the work of Erik Gunnar Asplund, Hans Scharoun, Hugo Häring, Günter Behnisch, Peter Hübner and the Graz School. He contributed to and co-edited Routledge’s Architecture and Participation. Mark Meagher is a Lecturer at the University of Sheffield School of Architecture. His research and teaching focus on applications of digital software and devices in design education, data visualization and fabrication. Prior to joining the University of Sheffield he was a member of the Media and Design Lab of the Ecole Polytechnique Fédérale de Lausanne (2006 – 2010) and the Center for Design Informatics at Harvard University (2002 - 2005).